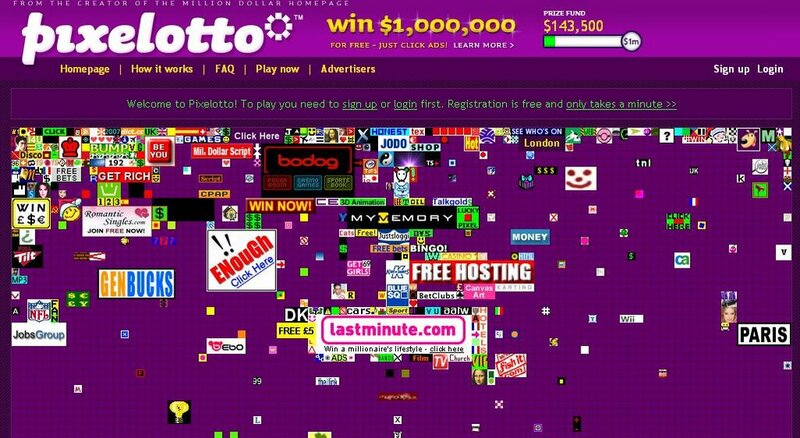 Alex Tew, who started the wildly successful Million Dollar Homepage, thought he could rest on his laurels and depend on the gullible public to fund his early retirement with Pixelotto, a site combining advertising with the lottery. The principle is the same as before except with a few cosmetic changes: each pixel on the site now costs $2, and visitors have a chance at a million dollar payout if they click the right ad at the right time. Three weeks after opening, 139,000 pixels have been sold to 423 advertisers. The last four days have seen no additional pixel buying, and several top advertisers have removed their listings. Beyond the ad slowdown and self-plagiarism, why won't Pixelotto work? A visitor to Pixelotto isn't interested in the advertiser's site when they click an ad pixel; they want $1 million. Since a maximum of 10 clicks (entries) is allowed each day, you want to click on 10 ads as quickly as possible and be on your way. You're not going to carefully scrutinize every site and, say, decide to buy a laptop from RCAM (a big advertiser which pulled its listing) or gamble on Bodog. As Google's Adsense program shows, contextually-targeted ads work better than indiscriminately showing random ads. If you click an ad, you're probably interested in what it's offering. With Pixelotto, however, you get many, many clicks, but, conversely, even fewer conversions (successful sales or whatever metric of success you use) since visitors don't care about what you're selling. I think Pixelotto will gain more advertisers in the new year, but slowly, as the data comes in, most of them will realize what a huge mistake they've made and pull their listings. Lightning doesn't strike twice: Alex, the first time it was cute, but doing it again is just lazy and unimaginative. What do you think about this new idea? "Own a piece of the Internet for ever"